You can now record career stats and earn rank by playing with a free registered account. Added leaderboard so players can compete for the highest # of kills, player kills, MVP, etc. 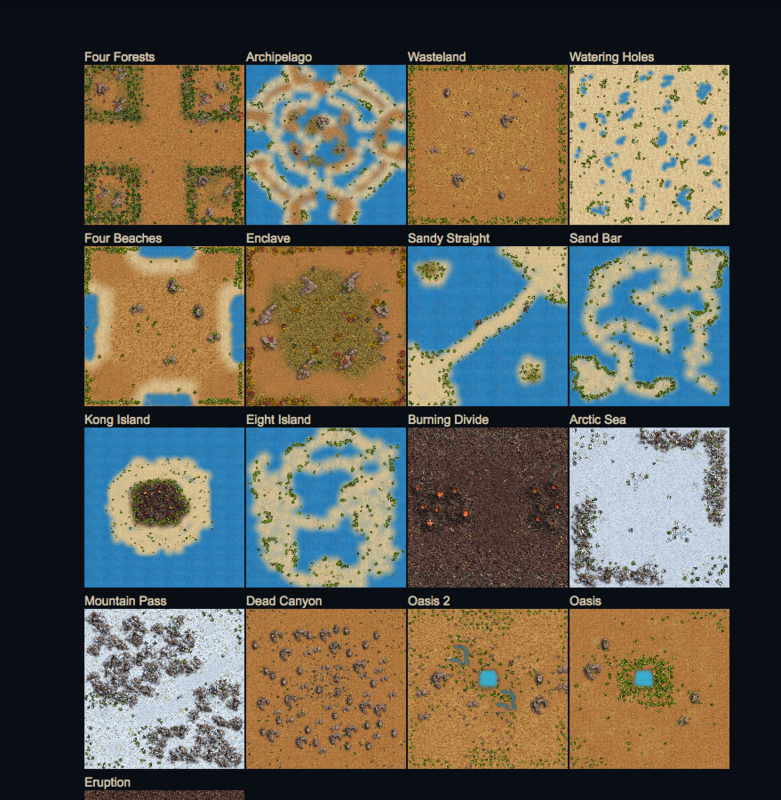 New map rotation: Eight Island, Dunescape, Sandy Straight, Enclave, Mountain Pass and Four Beaches. Healthbars are now team-colored (i.e. blue or red) to make it easier to distinguish friend from foe. Made significant performance improvements by not creating sprites for explosions and effects that happen outside the camera. Fixed the manta scale looking off. End game screen is not 30 seconds instead of 20, to give you time to read end game stats as well as player career stats. Increased font size of hero unit text as well as health bar length and position. Changed server max to 40 (instead of 50) for better performance. Hero kills no longer count as normal kills. Instead, the only count as PKs. When a team's supply is depleted, it now says the color of the team instead of the number. Manta speed increases dramatically with level up (10% per level, not compounded) and initial speed increased; manta base damage reduced from 110 to 95 and health reduced by ~15%. Javelin health increased by ~25% and damage increased ~20%. Manta now turns instantly to the mouse pointer instead of tweening. Increased Harpy damage from 55 to 60 (new ability coming soon). Roller bullet speed increased from 700 to 1200 and base damage increased from 210 to 230. Silencer base damage increased back to 300 from 290 and health increased 20%. Battleship guns now turn instantly towards the pointer. Hero on hero damage cut in half to dramatically increase time to kill. Peregrine base missile damage reduced from 400 to 350. Players can now choose display names without registering. Auto-balance is now working properly. Default sort order is now by kill count on the end game screen. Users who were having the problem of a connection screen forever should no longer have the problem. Fixed logo + load bar not centered vertically on load screen. Min time for chat to disappear is now 15 sec. When a game exceeds the time limit, the server will tell you what that time limit was. Manta no longer points in the wrong direction sometimes. Fixed Manta size looking off. Changed manta description to "Highly maneuverable light fighter which gets increasingly faster as you level up." Fixed droids being easy to kill for free XP. If a player joins a game already in session, the end game screen stats should now be accurate. Game time limit reduced from 900 to 800. Supply counts now more accurate because they are controlled by the server instead of clients. Removed old text “Leveling up increases health, damage or firing rate” from advanced units tooltips. Battleship now has a boost ability. Shockwave on Ion Cannon and Roller does significantly more damage. Silencer, Javelin and Roller now have the teleport ability. The Bomber and Harpy now have the land ability. Increased Merk health by 200 HP. CC health increased by 50%. Teleport ability cooldown is now 45 seconds. Fixed unit ability icons sometimes hiding beneath health bars. Changed how game state for connecting players is received, reducing lag for players already in a game. Fixed the home screen not getting passed the "connecting" message. Fixed units sometimes not firing (caused by the cusor hovering over alerts). You can now right-click to fire the Javelin which will prevent the camera from following the bullet. Gladiator primary gun start damage reduced from 300 to 275. Command Center now revives a small increment over time. Put a black partially transparent background around player scores for legibility. Increased Merk firing rate from 150 to 250 to make it do less damage. Increased Gnat firing rate from 100 to 200 to make it do less damage. Fixed zoom/camera getting messed up when the game resumes from network disconnect while zoomed out. Fixed gun recoil causing guns to go off-center. You can no longer spawn as 2 or more units.